A wedding ring guard can be a lovely choice to complement many different engagement ring designs, and there are lots of beautiful options on the market. A wedding ring guard is a specialized type of wedding band designed to protect both sides of the engagement ring while also enhancing its style. These bands are usually part of bridal sets, but specialized jewelers can also customize a guard to meet your needs. Ring guards come in a wide range of styles designed to complement almost any engagement ring. Whether you select a style with diamonds or colored gemstones, you'll have lots of shopping options. Diamond Solitaire Ring Guard - This exquisite guard from Fred Meyer Jewelers boasts 1/2 carat of round, brilliant-cut diamonds set in 14k yellow gold. It retails for about $1,300. Round and Baguette Diamond Ring Guard - Featuring 0.50 carats of sparkling round and baguette diamonds set in a two tone band made of 14k white and yellow gold, this exquisite ring guard is a great choice for any type of solitaire engagement ring. It retails for about $1,300. White Gold and Diamond Ring Guard - This striking ring guard from Zales is crafted from 14k white gold and features half a carat of baguette and round diamonds. It retails around $2,400. Diamond and Blue Sapphire Antique Ring Guard - This pretty 14k white gold option fro Ann Harrington Jewelry features 0.33 total weight carat of diamonds and blue sapphires pave-set in a vingtage-inspired ring guard that surround your solitaire. 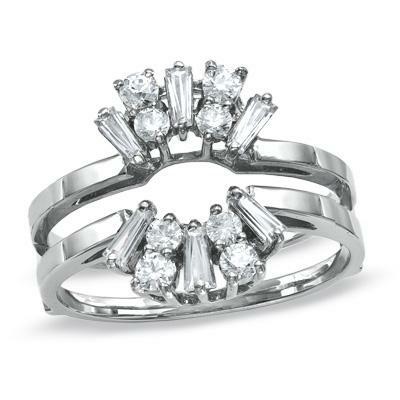 It works well with many shapes and sizes of solitaire engagement rings and retails for just under $1500. Ruby Ring Guard - Featuring three tiny round rubies on each side, this 14k yellow gold ring guard from Gracious Rose is simple and exquisite. It works best with a round solitaire engagement ring and retails for just over $700. 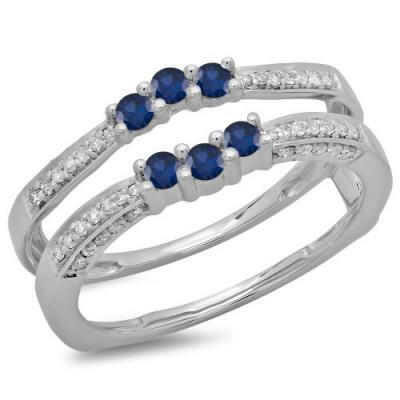 Sapphire and Diamond Three-Stone Guard - This ring guard from Amazon is made of 14k white gold and features three sapphires on either side of the solitaire. White diamonds extend down the sides for added sparkle. It retails for about $500. Even if you don't have a solitaire engagement ring, you can still have a ring guard. Many jewelers can create a custom guard to go with any style of engagement ring. If you're interested in this type of style, inquire with a local jewelry store that does custom work. Is a Ring Guard Right for You? Ring guards have many advantages and disadvantages. It's important to understand these pros and cons before you decide if a ring guard is right for you. 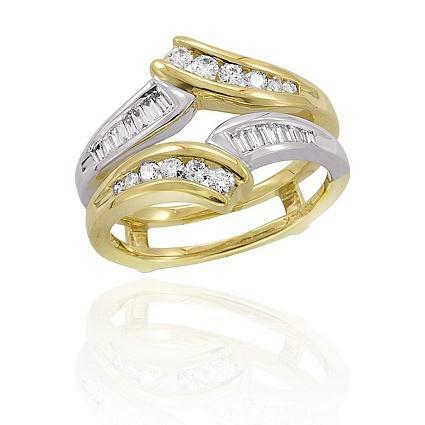 If purchased as a set with the engagement ring, ring guards are often a more affordable style than two distinct rings. Guards are specifically designed to help protect delicate engagement rings, particularly diamond solitaire engagement rings. Ring guards coordinate beautifully to create elegant sets rather than simply putting two rings side by side. The deliberate intertwining of two rings can add an element of continuity and romance to the design, symbolizing the longevity of the couple's relationship. A wedding ring guard is dependent on the engagement ring it encircles; it cannot be worn alone. This can be problematic for a woman who cannot wear her engagement ring continually or who prefers simple jewelry for everyday wear. If you choose a guard for your wedding band, the associated engagement ring cannot be used as an heirloom engagement ring without rendering the guard incomplete. Typically, guards are soldered to their respective engagement rings to form a single, solid ring. However, this can destroy any engagement ring engraving that was placed on the ring earlier. If the rings are not soldered together, the guard may inadvertently scratch the engagement ring if the fit becomes loose. Ring guards are sturdy designs that fit snugly on both sides of the initial ring to properly protect it against damage. Ring enhancers are beautiful accessories meant to increase the ring's visual appeal, but they may not provide thorough protection. Ring wraps completely surround the central diamond but may or may not protect the rest of the ring's band. While many ring guards are listed as "enhancers" or "wraps," if they protect both sides of the engagement ring, they are actually guards. A wedding ring guard is a lovely option to complement your engagement ring. With so many beautiful styles available, you're sure to find a guard that fits your budget and your existing engagement ring.